I don’t think there are that many “tricks” to doing well in organic chemistry, but there are a few. I was kind of surprised last month when I talked to a number of students who hadn’t ever come across today’s trick, which is probably the most useful of them all. I used to call it the “R/S toggle” but a much better name for it comes from Steven, who calls it the Single Swap Rule. Here’s how it works. Take a molecule with a stereocenter, like (S)-2-butanol (drawn below). 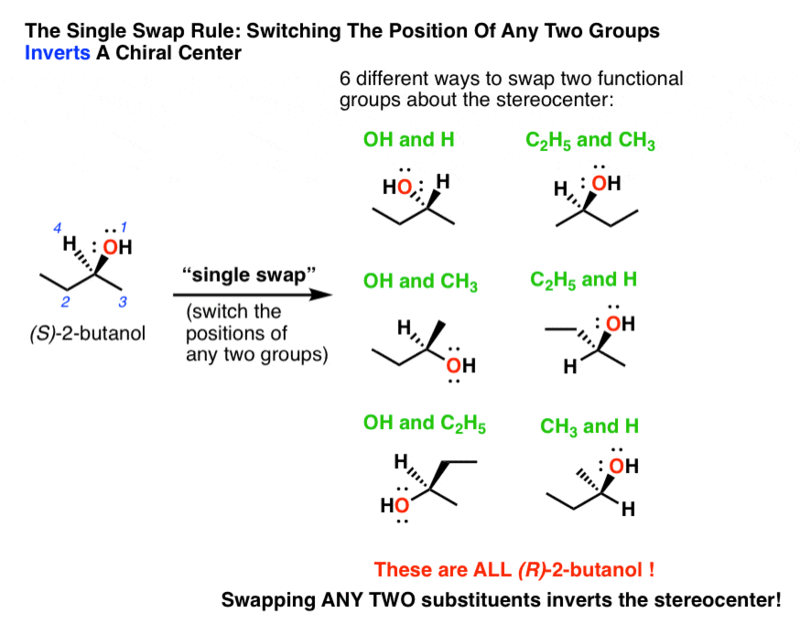 If you swap ANY TWO substituents, you will invert the configuration of the stereocenter. That is, switching any two substituents will give you (R)-2-butanol. There are six possible ways you could do this, and they’re all depicted below. By the way, don’t take my word for it – if you can’t see this, demonstrate to yourself that each of these six molecules is (R)-2-butanol . The Single Swap Rule comes in handy for two situations in particular. When you need to draw the enantiomer of a stereocenter – like when you are drawing the product of an SN2 reaction for instance. The first order of business in determining whether a stereocenter is (R) or (S) is to number the priority of the substituents according to their priorities. I’m not going to talk about how to do this today, although there are plenty of great resources on how to do so if you’d like to practice this essential skill. 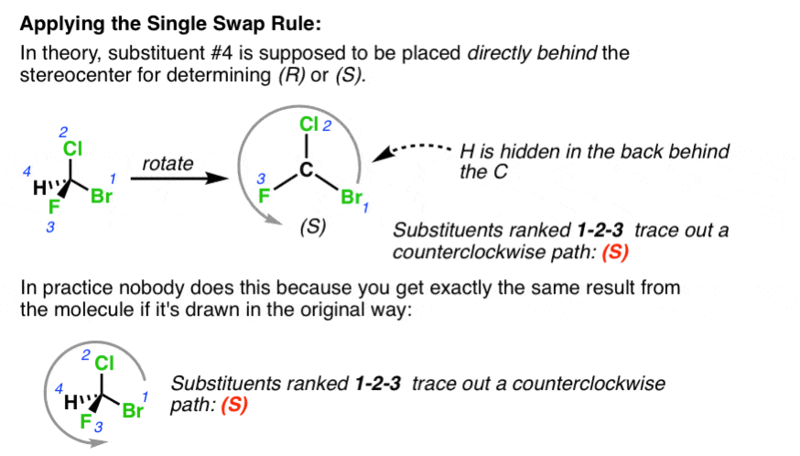 According to the rules, once you’ve ordered the substituents, you need to put the 4th ranked substituent in the back and then determine whether the 1st, 2nd, and 3rd ranked substituents trace a clockwise or counterclockwise path. In practice, few people follow this to the letter. That’s because you still get the same result if the 4th ranked substituent is connected to a dashed bond. The upshot of this is that determining (R)/(S) is fairly straightforward as long as the 4th ranked substituent is dashed. But what if your examiner unhelpfully draws the 4th ranked substituent as a wedge, or even off to one side? That’s where the Single Swap rule comes in handy. Let’s say we’re given this molecule. Note that priority #4 is pointing out in front. 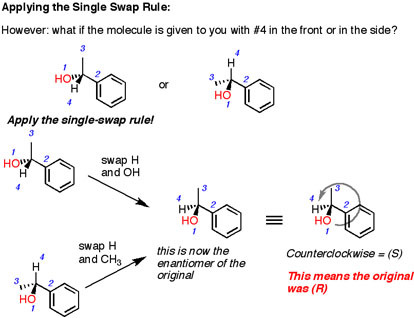 Instead of redrawing the whole molecule to depict it such that #4 is in the back, we can now bust out this trick. Switch the #4 substituent with whatever is in the back. Since we’re doing a single swap, we’re going to *invert* the stereochemistry from (R) to (S) or vice versa. Now since the #4 is in the back, we can easily determine (R)/(S) – and here, it’s (R). Since we did a single swap, that means that our original stereocenter must have been (S). What if #4 is pointing off to the side? Same thing. Swap it with whatever’s in the back. This will invert the stereochemistry. So again, when we determine (R)/(S), we remember that our original stereocenter will be the opposite. Drawing the enantiomeric configuration at a stereocenter. 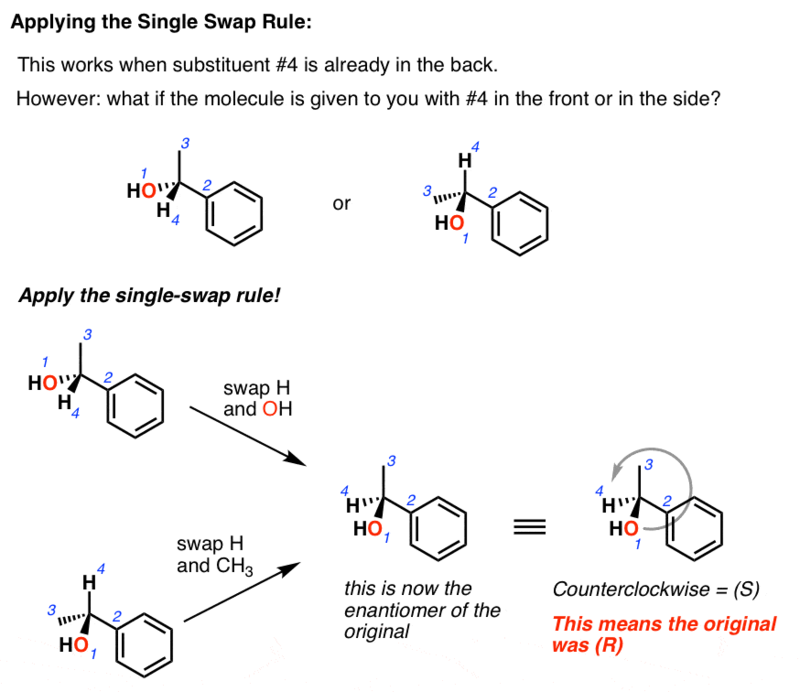 The Single Swap Rule also comes in handy when you need to show that a stereocenter has gone through inversion of configuration. If you’ve studied the SN2 reaction, you know that due to the backside attack, this reaction proceeds with inversion. But I’ve seen lots of students get confused when it comes time to actually draw the products. The single-swap rule makes it easier. Here’s an example of what not to do – and also a way to systematically apply the Single Swap rule in order to be able to reliably draw inversion of configuration. Do this; 1) draw your starting material. 2) do a single swap. this will invert the stereocenter. 3) replace your leaving group with your nucleophile. That’s it. You’ve now shown an SN2 with inversion of configuration. The Single Swap also works for Fischer projections, Newmans, you name it – this is why, I hasten to note, you aren’t allowed to flip any two atoms on a Fischer – you end up getting the opposite configuration. With practice you’ll end up doing this in your head – just figure out the priorities, trace the path of 1,2, and 3, and if #4 is in the front or on the side, remember that it’s the opposite of whatever you get (because #4 is in the front). It’s probably the most useful “trick” there is in Org 1, and I still use it almost every single day. Here’s a video showing the Single Swap Rule in action. I just learned another trick – by using my hands. Apparently, you can point your thumb of one hand in the direction of the 4th priority group (that means point it into the page if that’s where the 4th group is going), and whichever hand’s fingers roll in the direction of the 1,2,3 priorities (left hand is S, right hand is R) is the winner. This seems to work even if the 4th priority is pointing out of the page, or across it. Hope that’s clear! Interesting. I’m getting it to work in most situations, but not all. For instance check the first diagram, second row, example on the left. Using that method I get S. What about you? The hand rule is also what I learned, and I’m pretty sure it always works. After reading your comment I went back to all of the molecules on this page and checked…they all agree with the hand trick, so I’m not sure of the problem you’re having. The hand rule requires you to picture the molecule in 3D and rotate your fingers that way, rather than just looking at clockwise/counterclockwise. It’s never failed me. It’s how I know if I’ve rotated molecules correctly or not when doing problems. Super helpful, in my opinion. This is because you used the other hand. The thumb rule works for only one hand – either left or right. If you use the other hand, the REVERSE is true. Hope you get what I’m saying. WOW I NEVER KNEW THIS!! SOOO HELPFUL! THANKS ITS WAS DIFFICULT TO ME TO UNDERSTAND BUT NOW I DID. but this doesn’t work for SN2 reactions. The reason is, if there’s a change in priority order, then the R –> is still R for example. it’s not S. yes, there is an actual physical inversion but the R is still R depending on whether the Nu is bigger or smaller than the LG. Feel free to correct me if i’m wrong. i really want to use the single swap rule even for SN2. Obviously some thought has to go into it when applying it for SN2 reactions. The SN2 reaction will always invert stereochemistry, but it will not always convert R to S (or vice versa). Hmm please correct me if im wrong but i dont think this works for substitution reactions. because what there is a change in priority order when naming? Ex) original was R but depending on whether the LG is larger/smaller than the Nu, the priority will change and hence naming it will be R, even though there was yes, a physical inversion of config. It will accurately show the change in configuration. However it will not accurately predict whether R is converted into S. I recommend doing this yourself on the substitution product. Do the stereochemistry invert for acid/base reactions or only SN2? Before the swap, it was S. Hydrogen should be at the back instead of Bromine. Even after rotating/swapping between H and Br, I am getting an S(CCW). Even in the site from which I saw this problem, says its an R. What am I doing wrong? Fantastic post as always James!! Just a few corrections needed in my opinions. I think your assignments of the stereocenters for the two tartaric acid molecules were wrong. I have tried to convert the drawings to line-wedge diagrams and found out that your (R,R) molecule should be (S,S) instead! Correct me if I am wrong. Thanks for your great content !! Shoot. You are correct. Let me fix this. I also just noticed that the Newman projection molecule on the left (just to the right of the two tartaric acid molecules) should have S configuration instead! When I converted the Newman projection to line-wedge drawing, the H is on a wedge, while OH is on a dashed bond. So I think that the real configuration should be reversed to S! I want to start off by saying thank you so much for your amazing website! It has been so helpful and I use it to prepare before every test! 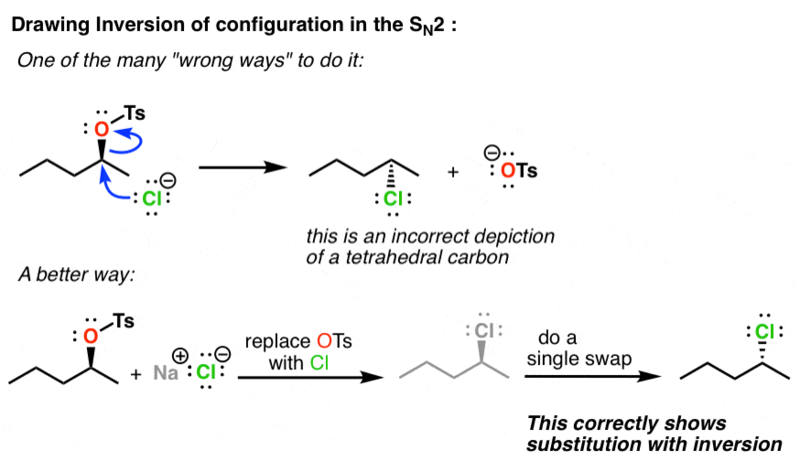 Is it valid to keep the “positions” of the substituents the same but change the wedges and dashes? So for example, if we had (S)-2-butanol could we make (R)-2-butanol by making the wedge of the OH group a dash and the dash of the H a wedge without doing any other swapping?